You can create model tests that are compatible with continuous integration (CI) systems such as Jenkins™. 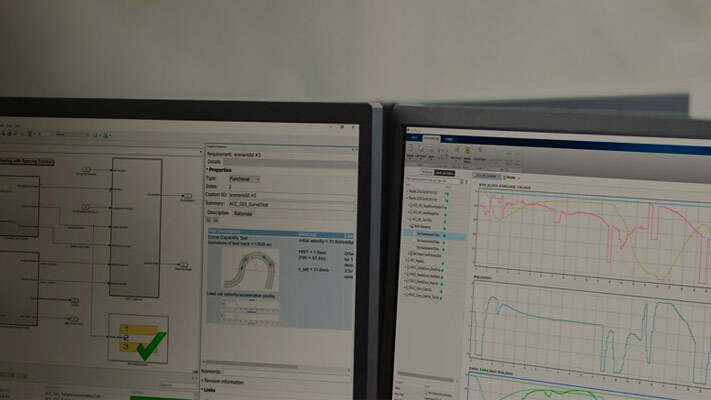 To create CI-compatible results, run your Simulink® Test™ files using MATLAB® Unit Test. Create a test suite from the MLDATX test file. Create plugins for the test output or coverage results. For test outputs, use the TAPPlugin or XMLPlugin. Only top model coverage is reflected in the Cobertura XML. Only model Decision coverage is reflected, and it is mapped to Condition elements in Cobertura XML. Create plugins for CI-compatible output. Add the plugins to the test output or coverage results. Add the test output plugins or coverage result plugins to the test runner. This example shows how to test a model, publish Test Manager results, and output results in TAP format with a single execution. matlab.unittest.plugins.TestReportPlugin produces a MATLAB Test Report. sltest.plugins.TestManagerResultsPlugin adds Test Manager results to the MATLAB Test Report. matlab.unittest.plugins.TAPPlugin outputs results to a TAP file. The test case creates a square wave input to a controller subsystem and sweeps through 25 iterations of parameters a and b. The test compares the alpha output to a baseline with a tolerance of 0.0046. The test fails on those iterations in which the output exceeds this tolerance. Before running this example, ensure that the working folder is writable. 1. Open the Simulink® Test™ test file. 2. In the Test Manager, configure the test file for reporting. Under Test File Options, select Generate report after execution. The section expands, displaying several report options. For more information, see Save Reporting Options with a Test File. 3. Create a test suite from the Simulink® Test™ test file. 4. Create a test runner. 5. Add the TestReportPlugin to the test runner. The plugin produces a MATLAB Test Report F14Report.pdf. 6. Add the TestManagerResultsPlugin to the test runner. The plugin adds Test Manager results to the MATLAB Test Report. 7. Add the TAPPlugin to the test runner. The plugin outputs to the F14Output.tap file. Several iterations fail, in which the signal-baseline difference exceeds the tolerance criteria. Generating test report. Please wait. Preparing content for the test report. Adding content to the test report. Writing test report to file. A MATLAB Test Report that contains Test Manager results. A TAP format file that you can use with CI systems. This example shows how to generate model coverage results for use with continuous integration. Coverage is reported in the Cobertura format. You run a Simulink® Test™ test file using MATLAB® Unit Test. 1. Import classes and create a test suite from the test file AutopilotTestFile.mldatx. 2. Create a test runner. 3. Set the coverage metrics to collect. This example uses decision coverage. In the Cobertura output, decision coverage is listed as condition elements. 4. Set the coverage report properties. This example produces a file R13Coverage.xml in the current working folder. Ensure your working folder has write permissions. 5. Create a model coverage plugin. The plugin collects the coverage metrics and produces the Cobertura format report. 6. Add the coverage plugin to the test runner. 0 Passed, 1 Failed (rerun), 0 Incomplete.